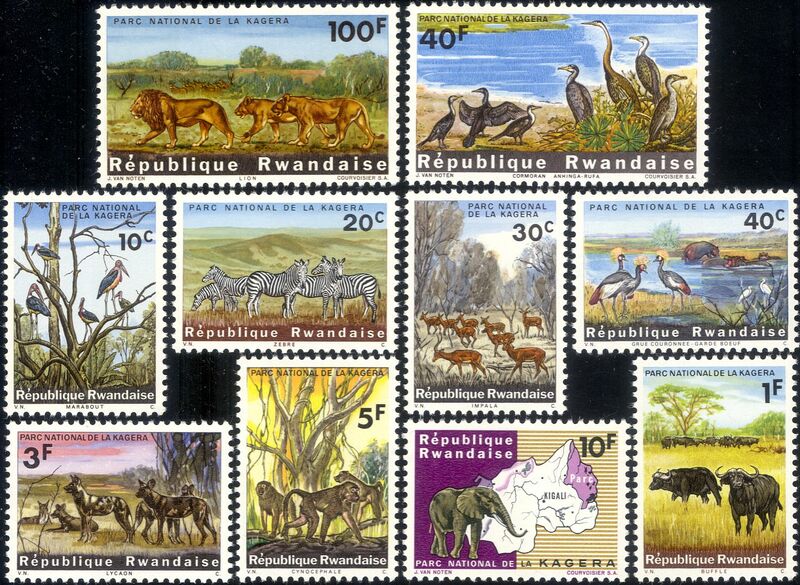 Rwanda 1965 Kagera National Park 10 value set featuring Common Zebra, African Buffalo, Marabou Storks, Impalas, Crowned Cranes, Hippopotamus, Cattle Egret, Hunting Dogs, Yellow Baboons, Elephant and Map, Reed Cormorants, African Darters and Lions - in superb u/m (mnh) condition (Stanley Gibbons 2017 Catalogue Value £21+) - excellent country, animals, wildlife, zebras, buffaloes, cats, antelopes, hippos, conservation, environment, nature thematics. If you cannot find the specific stamp set or thematic/topic you are looking for either here in my shop or at the brumstamp stamp shop on eBay http://stores.shop.ebay.co.uk/The-Brumstamp-Stamp-Shop please do not hesitate to contact me. Enjoy browsing and shopping. Andrea!